Enclosed public spaces such as shopping centres, restaurants, recreational spaces and hospitality areas can become very noisy and not only deter people from visiting and using these facilities, but can also cause adverse health effects in the long run. When exposed to noise pollution over years, people can develop hearing problems, which could lead to complete deafness, or pupil dilation, which could lead to loss of eyesight over time. Mental health can also be affected since noise pollution imposes a sense of panic and may shorten a person’s temper. Lower concentration levels, increased blood pressure and a higher chance of heart attacks in the long run are some of the risks associated with exposure to high sound levels. Fabricmate absorption panels from Aluglass Bautech can easily be retrofitted in shopping malls, restaurants, play areas and other noisy areas. With noise reduction coefficients (NRCs) ranging from 0,5 to 0,85, it reduces both unwanted noise reflections and echoes, while at the same time providing flexibility in design thanks to a wide range of finishes. Fabricmate’s track system can custom fit any required space from screen wall to back wall, and contours to any architectural detail. It is quick and easy to install, environmentally friendly and cost-effective. 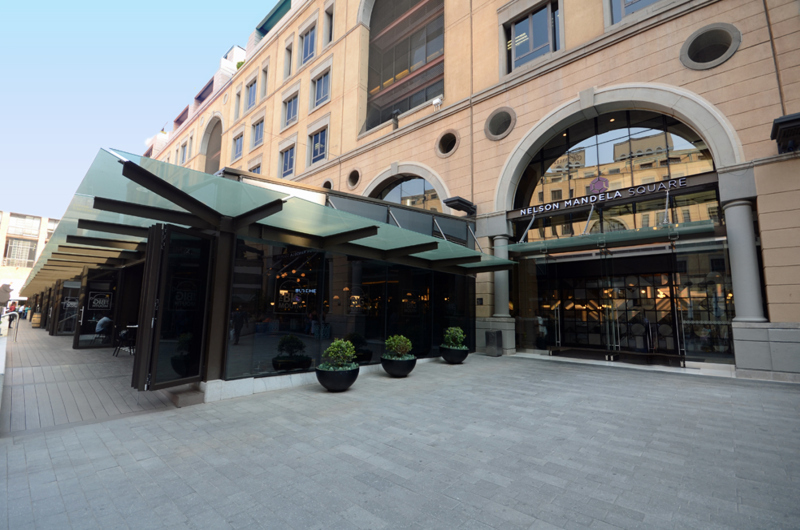 Stackable Sliding Folding Doors allow the restaurants around the square to enjoy the flexibility of having the glass partitions open when the weather is great and closed when it is windy or rainy. 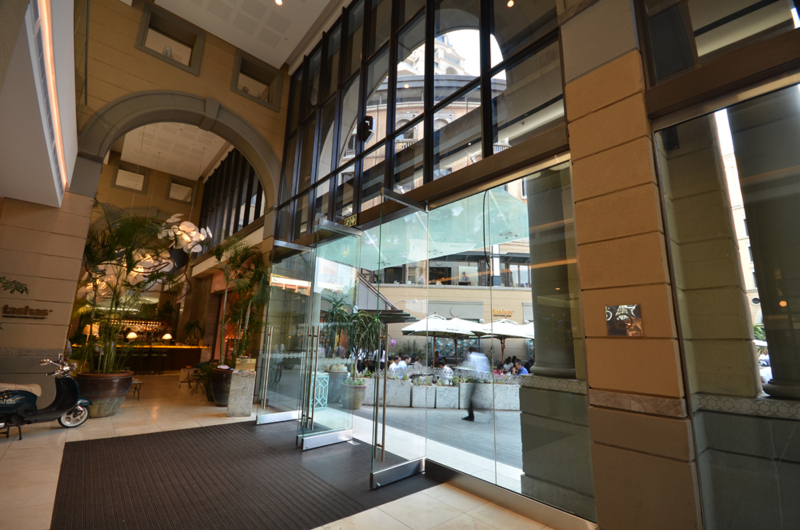 Aluglass Bautech’s Glassflex range of specialised glazing products offers a turnkey solution for facades, curtain walls, shop fronts, windows and doors. However, acoustic glass without an appropriate frame won’t be effective, therefore Aluglass Bautech has partnered with HBS Aluminium Systems to provide optimal, framed aluminium and glass solutions designed to enhance acoustic properties. Glassflex glass partitions offer both insulation and acoustic properties without blocking natural light. These can make a big difference in containing noise in restaurants, shopping centres and more. Frameless Glass Doors are an exclusive feature to the entrance. 19mm thick clear toughened safety glass was used to produce the 3.6m high entrance doors. In addition to being a key requirement for safety in enclosed public spaces, Aluglass Bautech’s fire doors can also contribute acoustically. Well suited to serve as an emergency exit, the Varikust VK62F is a Class A door with a 43dB acoustic rating, maintaining integrity, stability and insulation for over an hour. In turn, The Varikust VK105F is Class D door, with an optional 48 or 51dB acoustic insulation rating, and which can maintain integrity, stability and insulation for at least two hours. This door is architecturally and design appropriate for any emergency exit or hotel room door. Varikust acoustic fire-rated doors are designed and tested to contain the spread of fire in a building and can be installed in single- or double-leaf configurations, and decorated with a wide range of laminates or viewing panels of fire-rated glass. Contact Aluglass Bautech for more information, technical product features and advice.